A clean-up operation is under way after heavy rain caused flooding in parts of Lincolnshire. BBC Weatherman Paul Hudson reported 28mm of rain falling in Coningsby in one hour on Thursday, the usual amount for two weeks. 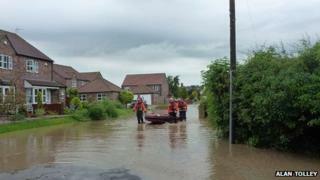 Lincolnshire Fire and Rescue dealt with more than 150 flood-related calls during a 12-hour period. Police reported other incidents in Grantham, Sleaford, Metheringham and Dorrington. Andy Wilkinson, flood risk manager at the Environment Agency, said: "The incident room in Lincoln was manned all night. "We've had teams out on the ground making sure there are no obstructions, making sure the rivers can pass through any water that's going through them. "We made sure we did everything we possibly could on the ground." In Horncastle, the landlord of the Admiral Rodney Hotel, Kevin Charity, said: "We've lost six ground floor bedrooms and the restaurant has been flooded." North Kelsey Road in Caistor was also damaged by the flooding and remains closed on Friday morning. Two people had to be rescued by boat after their house at Timberland, near Woodhall Spa, was flooded. Alan Tolley who lives in the village said: "The bottom of the village was completely flooded to a depth of about one foot. "An elderly couple in Hallams Lane - the ground floor of their house is completely wiped out." A flood alert has been put in place for parts of the county.